Whether you’re making pancakes and bacon for breakfast or enchilada nacho bowls for dinner, a camp stove is the most important piece of gear in your outdoor kitchen. Are you buying gear for your first family camping trip? Thinking about an upgrade? Here’s what you need to know to choose a camp stove. Stoves for car camping generally have 2 burners similar in size to the ones on your home stove—and you can use your home-size pots and pans when you cook on them. Backpacking stoves (not included here) are a lot tinier. Expect to pay $40 to $50 for a basic camp stove like a Coleman Matchlight to $150 and up for a fancier stove like a Primus FireHole. The difference in price plays out in a couple of key features, which may or may not be important to you, depending on how much you’ll be cooking. One difference is cooking space. A basic stove like the Matchlight has room for 1 big frying pan or pot and a small saucepan at the same time. A roomier stove like the FireHole will hold two big frying pans or pots side by side. That price difference also plays out in power. Lower-end camp stoves put out about 10,000 BTUs per burner, vs. 12,000 BTUs on fancier models, which affects how long it takes to cook dinner. 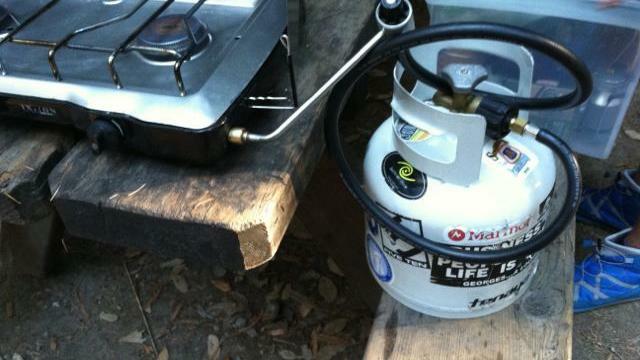 Propane tends to be the most popular fuel option for car-camping stoves. Outdoor stores carry little propane cylinders, which are nice and portable. But not many places recycle the empties. So you might want to consider buying a refillable 1-gallon tank from an RV supply store, which can last for weeks. You’ll also need an adapter and hose. When you’re buying a stove, look for one with a sealed surface and a removable grate so it’s easy to wipe up any spills. Cooking on a 2-burner camp stove is pretty much like cooking on a home stove: click, light, and you’re ready to go. For more details, like how to connect the propane, check out our video on buying and using a camp stove.